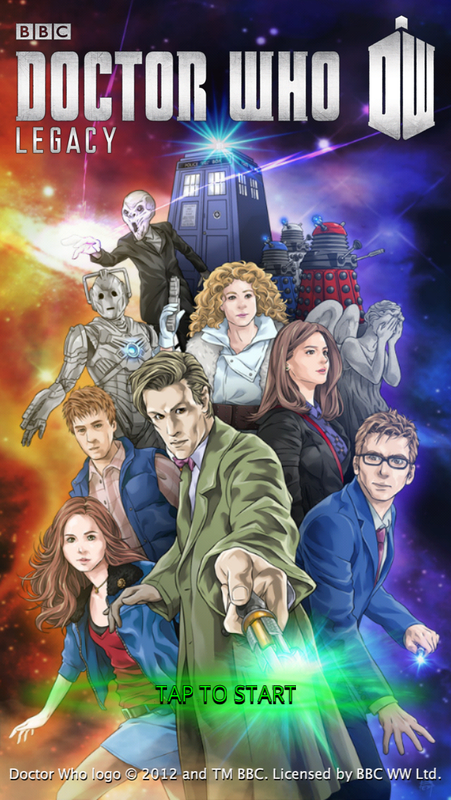 The recent celebrations for the 50th anniversary of the science fiction television series Doctor Who certainly resulted in a lot of interest in the franchise as a whole. At the same time, this also resulted in a lot of different Doctor Who related books, toys and even mobile games all tied into the celebrations. Doctor Who: Legacy is one of the those games that actually got a huge boost of interest in the weeks after the 50th anniversary. The game became available for downloading in the region by December, which was just in time for their big advent promotion. On the surface, the game seems to be little more than just another match-three type of game that we've been seeing time and time again over the years. But in truth, it's a nice spin on the classic game genre and it offers a very nicely integrated Doctor Who experience for all you Whovians out there. The game isn't exactly a cake walk either - you will need to be pretty strategic in how you deal with each stage and its various Doctor Who enemies. And that's where all the fun lies. Doctor Who: Legacy is a mobile game that is free to play for both iOS and Android. The game was developed by Tiny Rebel Games under license from BBC Worldwide. At its core, this is just like most other match three games out there. You create chains of gems that are at least 3 gems long and see how things fair. One of the twists of the game in terms of the match three genre is that you're not just limited to switching two adjacent gems. You are free to drag a gem to anywhere you want on the board, and thus you can use this ability to move other gems around and build additional gem chains accordingly. In terms of the Doctor Who part of the game, you get to help the Doctor put together a team of Companions to face the various enemies that we've all seen on the show. Each version of the Doctor and all of the Companions each have a corresponding color and having them in the team means that they do damage to the Doctor's enemies whenever you match their color on the board. Chains at least 5 gems in length will do damage to all enemies at once. Subsequent chains triggered in a single sequence multiplies the damage that you can do to your enemies. Enemies have their own strengths and weaknesses, so it's important to tailor your team accordingly. Unlike most other mobile games, Doctor Who: Legacy does not apply an energy system to limit how much you can play. This is pretty great since it will take you some time to get used to the strategy of how to play this game effectively. In my experience, it's more important to have more chains of gems happening in a single cascading sequence as opposed to trying to make that one very long chain. The damage multiplier effect does a heck of a lot more than just hitting the whole mob with one damage rating. The drop rates for additional Companions and costumes varies from stage to stage but expect to re-play a single stage a number of times before you get the Companions that you particularly want. I may already have Amy Pond and Rory Williams, but I still can't seem to snag Cleopatra, for example. You also get various Time Fragments randomly as you defeat enemies and these fragments are key to upgrading your characters and improving their abilities. The availability of such Fragments acts as a level control mechanism early on and you'll be dying for those precious Heart Time Fragments well before you complete the first set of stages set in Season 7. The game does have a nicely active social media presence, particularly on Facebook. The aforementioned Advent promotion was advertised on their Facebook page on a daily basis and that meant a lot of Companions, Time Fragments and Time Crystals (the game's in-app currency) for fans of the page. So yes, this really is one of those times when it pays off to Like the page if you're going to get into the game. Doctor Who: Legacy is a great casual puzzle game for all you fellow Whovians out there. There's a unique joy that comes with unlocking your favorite Companions and finding out how they can help your game that really helps drive things along. Thus the game rates a solid 5 surprise character drops out of a possible 5.